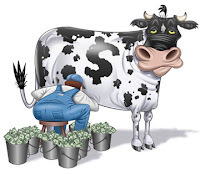 On his CAP Reform blog Jack Thurston has a story that illustrates one of the many reasons why reforming the EU's wasteful and protectionist farming policies is so difficult. The post centres on Henrik Høegh, Denmark's newly appointed Farming Minister, who is a long-time recipient of EU farming subsidies. Since 2000, he has received a whopping €604,787.00 from the Common Agricultural Policy and his son and daughter are also thought to be receiving EU cash. Indeed, Høegh is not the only farming minister to have been in receipt of EU subsidies. In an outright conflict of interest, Mr Høegh is now responsible for signing his own subsidy cheques, but also, as a member of the EU’s Council of Agriculture Ministers, deciding on the future of the CAP. As Thurston concludes: "With the long-term future of the CAP currently under debate, can the Danish people be confident that Mr Høegh will be pursuing the public interest rather than his own private profits?" EU Foreign Minister Catherine Ashton is absent from the meeting of EU defence ministers in Majorca today - the first to be held since the Lisbon Treaty came into force. AFP reports that the defence ministers will be considering increased permanent structured co-operation, where several member states can move cooperation on common security and defence policy forward on their own under the terms of the Treaty, with the say-so of only a qualified majority of member states. However, Lady Ashton has been double booked, and will instead attend the investiture ceremony of the new Ukranian President, missing discussions on how Lisbon will impact on defence cooperation. One EU diplomat said they has been really looking forward to hearing Ashton's views, "Especially as, thanks to the treaty, the opportunity is there to reinforce Europe's defence, to give it more visibility". Another rather snippy EU diplomat also said, "Her predecessor Javier Solana didn't miss a single meeting of this type with the defence ministers. Something has changed in the order of priorities." Jean Quatremer describes Ashton's "empty-chair policy" as "all the more infuriating" because NATO Secretary-General Anders Fogh Rasmussen is to attend. Spain, current holder of the EU Presidency, has made relaunching EU defence strategy one of its priorities of its six month term. The Spanish Defence Minister Carme Chacon has said that one of the issues defence ministers are working towards is "progress towards a European armed force; step by step, but that is our objective." She has that objective in common with Germany, whose Foreign Minister said earlier in the month that the creation of a European army should be the long term goal of common security and defence policy. With various EU defence ministers dreaming of a European army, the US yesterday made more noises about Europe's unwillingness to contribute to NATO, with Defence Secretary Robert Gates saying that the "pacification of Europe" has gone too far and is "an impediment to achieving real security and lasting peace in the 21st [century]", and Secretary of State Hillary Clinton calling for an "honest discussion" of European defence spending. Ashton's decision to make a ceremonial visit to the Ukraine rather than discuss co-ordinated EU defence policy will not doubt be frustrating for the French and Germans, who have been talking about a Franco-German security policy driving EU defence, but is a telling reminder to the outside world of the EU's preference for pomp and ceremony over dealing with the challenges of the here and now. For one, the US' patience is clearly running out. EUobserver today reports that Swedish Foreign Minister Carl Bildt has written an angry letter to EU Foreign Minister Catherine Ashton demanding to know why Commission President Jose Manuel Barroso has appointed 'his man' as the EU's new ambassador to Washington when, under the Lisbon Treaty, Ashton is meant to be overseeing such appointments. Ashton is currently in talks with the member states about establishing the EU's new diplomatic corps, the External Action Service (EAS), and Barroso spotted this "transitional" phase as an opportunity to install Joao Vale de Almeida, his former chief of staff, as his eyes and ears in Washington. As one EU diplomat said, "In the future, if the US wants to send a message to the EU, it will go through Almeida because it knows he has a special relationship with Barroso. Ashton will be left out." As Charlemagne points out, Ashton, who is supposed to serve both national governments and the Commission, has consistently been criticised by member states for being in bed with the Commission and allowing it too much sway over the EU's new foreign policy apparatus. 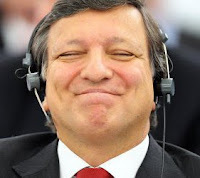 No one can argue that this isn't a significant and symbolic move by Barroso. After all, he didn't send his mate off to one of the EU's various new embassies in Kabul or Addis Ababa but to Washington! Many have argued that the appointment of the low-profile Ashton as EU Foreign Minister was an attempt by member states to limit the influence that the post would have over national governments. This of course begs the question why create the post in the first place? However, the 'play it safe' appointment of Ashton appears to be backfiring entirely as the Commission sees her weakness as a golden opportunity to increase its influence over the EU's foreign policy - a far greater threat to the institutional balance. It is tempting to admire Barroso's cunning but it’s also a bit worrying that national governments were powerless to stop him appointing an old mate to such a key position, given the clear conflict of interest. Incidentally, Carl Bildt is all over the place at the moment. Having been one of the strongest supporters of the Lisbon Treaty he now claims to have always predicted (like some others) that the institutional set-up that it created was destined to fail. "I’ve always questioned whether the construction would work... the post [EU foreign minister] is set up in a way that makes it virtually impossible", he told Swedish daily Dagens Nyheter. Just goes to show that there's nothing quite like the cold shower of reality to make people come to their senses. A leader in this week's Economist looks at one of the areas where the EU is rarely criticised: its competition policy. EU Competition policy can broadly be divided into two main areas. The first area deals with state aid - it is the job of the EU to prevent member states from subsidising their favorite industries. This task has proven particularly challenging in the crisis , as the Opel-Vauxhall case illustrates. But that is not what the paper is criticising. The article deals with the second area of EU Competition policy: fighting cartels, monopolies, and abuses of dominant market positions; and controlling proposed mergers, acquisitions and joint ventures. This area deals with firms rather than states. Another article notes that the EU’s antitrust case against Microsoft, which resulted in a €1bn fine, revealed that investigators failed to keep record of a meeting with an executive from Dell, raising suspicions that Commission staff overlook potentially exculpatory evidence. This is indeed extraordinary: Politicians in the European Commission have the power to impose a €1.06 billion fine on a company without proper due process. €1 billion is a lot of money. It is more than the annual net contributions to the EU of countries such as Austria and Denmark. What's more - and what isn't mentioned in the article - the EU can "hoard" the money it raises in fines by lining its own pockets, as Ashley Fox MEP recently pointed out. He said Competition Commissioner Joaquín Almunia had told him that the fines would be held by the Commission and used as part of the EU budget - and that Almunia had no plans to reform the practice. Fox proposed - quite sensibly - that instead: "Monies raised from anti-competition fines should ideally be returned to those consumers who have paid over the odds for products and services. However, as this would be virtually impossible to implement the best alternative is to return the money to the member states." Apart from the EU's heavy regulatory burden, if unreformed, EU competition policy might become another factor deterring business from coming to, and staying in, the EU. As we never tire of pointing out, the Lisbon Treaty has made sport an EU competence, which means various EU initiatives, decided on by majority voting, in this area are sure to be coming our way soon. The Commission is due to carry out a consultation with member states and relevant organisations in the first half of 2010 regarding the implementation of the Treaty's sports provisions, with the first 'sports programme' expected in 2012. The UK's Sports Minister Gerry Sutcliffe visited Madrid only this month to meet with his Spanish counterpart to discuss what might be on the agenda for sports regulation this year. Some may remember that in 2008 he managed to resist French plans - launched under its EU Presideny - for an EU-wide 'super' regulator for football, and other sports, which would have seen European football association UEFA able to enforce guidelines on the English Football Association. Then French Sports Minister Bernard Laporte said provocatively that the EU should help address the dominance of English teams in the Champions League. FIFA was lurking in the background trying to establish its 6+5 rule, which would have made it compulsary to field six domestic players, which would have hamstrung the big English clubs. However, the UK managed to convince the EU that its free movement rules should apply and the proposal subsequently died a death, although UEFA's watered down 'home-grown' rule was accepted. A spokesman for the Department of Culture, Media and Sport said at the time, "We support the special nature of sport but cannot support block exemption from EU law." Up to now the European Court of Justice has used EU free movement and competition law to rule on cases concerning professional football, treating it as any other economic activity. In it's Bosman ruling it denied authorities the right to set player quotas by nationality and allowed players the freedom to move clubs for free once their contracts had expired. However, the introduction of the Lisbon Treaty changes the game. It allows the EU to take into account "the specific nature of sport" and potentially exempt it from the rest of EU law, including free movement and competition provisions laid down under the Single Market. The UEFA President has long argued that football should be treated as its own entity, distinct from EU employment regulation, which would allow him to regulate as he sees fit. And it seems that UEFA is going to test the current legal ambiguity with a new set of proposals aimed at curbing the spending of Europe's biggest clubs by banning heavily indebted clubs from European competitions. The Premier League will once again be in its sights. The proposal states that its aim is to "improve the financial fairness in European competitions", which is striking similar to a clause in the Lisbon Treaty that says "promoting fairness and openness in sporting competitions" shall be an objective of the Union. If the big clubs or the big leagues were to protest against these proposals it will be up for the EU to decide how to interpret the Treaty and the ambiguities outlined above. The fact that Lisbon formally makes sport an EU competence only serves to strengthen the power of the EU to shape how football will be regulated in the future. The voting rules under Lisbon also mean that the UK is unable to veto EU initiatives in this area, which could prove highly significant. And in the end, the new rules mean that the UK could be powerless if UEFA has the EU's backing to push its new proposals through. Interesting article from Economics Professor and heavyweight Martin Feldstein in the Financial Times this morning - suggesting a temporary vacation from the single currency might be a plausible solution to the Greek debt crisis. It's one we haven't heard before...and definitely an interesting idea for how to take some of the pain out of Greece's restructuring. For more of our take on what the options for a Greek bailout might be, see our briefing from last week. The EU's finance ministers, and a handful of heads of state, are meeting today in another attempt to come up with answers to the 'Greek question'. No details are expected to be announced, although an agreed declaration will give Greece a month to get down to business and deliver real deficit cuts (it's unclear what the EU will do if these cuts aren't delivered). Apart from various wild swipes at the 'markets', EU leaders seem to be in disagreement over the involvement of the IMF in a possible Greek bailout. Sweden's able Finance Minister Anders Borg is one of the biggest proponents of a strong role for the Washington-based outfit, making several comments to that effect in the last week (in addition to refusing to rule out a role for non-eurozone countries in a rescue operation). But Jean-Claude Juncker, the Luxembourg PM and arch-federalist who heads the group of eurozone finance ministers, won't have any of that. He apparently declared Borg's call for greater IMF surveillance and monitoring of Greece to be an "absurd" irrelevance "fuelling by Anglo-Saxon voices" seen as hostile to the shared currency. "If California had a refinancing problem, the United States wouldn't go to the IMF", he said. Well, California to the US is not exactly the same as Greece to the EU - although in Juncker's world it probably should be. The comment pages of today and the weekend's papers were understandably filled with reflections on a potential Greek bailout and the wider implications for the euro and the EU as a whole. We argued in our recent briefing that a bailout would have far-reaching negative implications for the eurozone, establishing a precedent for rescuing profligate states that fails to address the inherent problems of a monetary union between the eurozone's differing economies without the harmonisation of fiscal policies, for which there is no public support. The crisis is nonetheless being used to justify the establishment of EU 'economic government' - the next step towards the federalists' Holy Grail of fiscal or political union, with common taxes and redistribution across the eurozone. This marks a significant change to the rules of the game, with the EU now largely dictating the terms of Greece's economic policy to the Greek government. This is precisely what citizens were told wasn't going to happen when EMU was designed and agreed, even if certain politicians had other ideas. It looks very much as if Greece’s fiscal sovereignty will be, for most practical purposes, temporarily suspended. [The EU] can either clutch its worry beads and hope that Greece, acting under formidable outside pressure, will transform itself into a self-disciplined polity. Or it can exploit this crisis as an opportunity to shift European monetary union into a higher gear by taking irrevocable steps to closer fiscal integration. The issue is not the failure to match economic and monetary ­union with political union. It is the naked disregard for democratic engagement in the entire system that in no small part ­explains why voter turnout in EU elections has plummeted by more than 30% in the last 30 years. Whenever people vote no to a phase of integration – as they did in Ireland two years ago – the EU simply orders them to vote again until they produce the right result. Once they vote yes there is no turning back. ...even for advocates of closer integration in Europe, this is a mistake. The EU suffers from a lack of popular legitimacy. The manner in which the Lisbon treaty was passed was unedifying, giving the impression that the EU is a stitch-up by a small elite. If Europe, or just the Eurozone, is to become more deeply joined, it should be a deliberate and honest process, not an accidental and covert one. There is no need for the EU to expose itself to these difficulties. It has another option for saving Greece: the International Monetary Fund. It would be embarrassing for a member of the EU to receive help from the Washington-based Fund, so admitting the continent could not solve its own problems. But better that than sleepwalking into constitutional upheaval. Going to the IMF is the best of a bad bunch of short term options but the EU's leaders have a nasty habit of staking pride and prestige ahead of the democratic process. It seems that yesterday was a rather gruelling day for EU leaders with hours of squabbling over how to handle the looming Greek tragedy. Then cue left enters EU President, Van Rompuy, who, we assume, wanting to lighten the atmosphere, decided to announce that he wants to triple the number of Commission summits from four to 12 a year! Why oh why must the EU's answer to everything be to call a pow-wow at which they can take yet another group picture to set on their mantelpieces? It is a frustratingly common trend for European leaders to equate summits with power. Remember that rotating Spanish President Zapatero is organising no less than fourteen of them for his six month stint. But there comes a time to admit that quality and not quantity should be the key - as the by now infamous 'Obama snub' made embarassingly clear. By the way, Van Rompuy seems to be on a bit of a roll, holding court in an old library and calling for an EU 'economic government', in addition to costing EU taxpayers some £20 million a year. As we've argued before, it would be a mistake to write this guy off as a non-factor in the EU elite's pursuit of ever closer union. Latest word is that the eurozone group is holding an emergency video conference this afternoon to discuss Greece's economic situation and possible ways to go ahead with a much anticipated (read: much feared) bailout of the country. This morning's press reports noted that eurozone countries had decided "in principle" to provide financial assistance to Athens, with German Finance Minister Wolfgang Schäuble telling officials in Berlin that there “was no alternative” to a rescue plan. Ahead of tomorrow's summit of EU leaders, we have published a new briefing looking at 10 different ways in which Greece can be bailed out. At the moment, some sort of eurozone credit facility or an IMF-style 'euro fund' seem to be the frontrunners. However, it's unclear whether these two options are actually legal under the EU Treaties 'no bailout' and 'no credit facility' clauses. (in fact, of the 10 possible bailout scenarios we looked at, only one - early payments of structural funds - is unambiguously legal under the EU treaties). Obviously lots of issues are on the table at the moment, but at least three consequences of a bailout are worth hammering home. First, as has been widely documented and argued, watering down the EU's 'no bailout' clause and the 'no credit facility' clause creates moral hazard of unprecedented proportions, and has previously been fiercely resisted by a whole range of EU politicans and central bankers - particularly in Germany. Former Chief Economist at the ECB, Otmar Issing, has said that this would spell an end to "the political stability of the monetary union". He said that, in order for financial discipline to prevail, every member state must be responsible for its own debt and deficits: "without this there would be no end", he said. Secondly, short term measures will not address the structural lack of competitiveness that affects not only Greece, but also countries such as Spain and Portugal. In order for the differences in competiveness within the eurozone to be addressed, a one-off bailout would need to be followed by continuous financial transfers from the poorer bloc to the richer bloc within the eurozone. Indeed, there would be no end. Thirdly, there's no public mandate or support for establishing a formal system of fiscal transfers - polling by Open Europe shows that 70% of Germans are against using taxpayers to bail out another member state. This means that eurozone countries are stuck in a very tricky dilemma: either accept continual strains on the eurozone, stemming from the weakness of Greece and others, or pursue a policy of closer economic integration, for which there's no public support. Likewise, EU President Herman Van Rompuy has said, “Whether it is called coordination of policies or economic government” only the European nations working together are “capable of delivering and sustaining a common European strategy for more growth and more jobs…Recent developments in the euro area highlight the urgent need to strengthen our economic governance”. Former European Commission President Romano Prodi once said that a future crisis could be exploited to radically speed up the pace of economic union: "The euro will oblige us to introduce a new set of economic policy instruments. It is politically impossible now. But some day there will be a crisis and new instruments will be created." It seems Barroso and Van Rompuy are intent on proving him right. For the immediate short term purpose of helping out Greece, as we argue in our briefing, the simplest and most sensible option would be to go to the IMF. The Swedes and the UK reportedly both want it but it seems as though the eurozone standard-bearer, Germany, is too proud to contemplate this route. So integrationist politicians now see in the financial crisis and the introduction of the Lisbon Treaty a chance to take a quantum leap towards a common economic government in the EU and it seems that even Germany - that so far has opposed any movement towards EU fiscal federalism - may be willing to move out of the way. Following German Foreign Minister Guido Westerwelle's speech at the weekend, announcing that the long term goal of EU security and defence policy under Lisbon should be the creation of a European army, the French Defence Minister Hervé Morin today made a rather different, but nonetheless important announcement. He revealed that, after much um-ing and ah-ing, France is to sell one, and possibly as many as four, amphibious assault ships to Russia. The Economist's Charlemagne correspondent notes that after seeing one of these ships at St Petersburg in November 2009, Russian PM Vladimir Putin said on a visit to Paris: "I can assure you that if we purchase this armament, we will use it wherever deemed necessary." Similarly a senior Russian admiral declared that if such ships had been in the fleet in 2008, Russian forces would have overrun Georgia "within 40 minutes", rather than in 26 hours. The WSJ notes that both the US and the eastern European members of NATO are not amused and it's certainly unlikely that France's decision will do anything to dispell the concerns in both the UK and the EU accession states that its vision for EU defence policy poses a threat to the transatlantic alliance. Franco-British military cooperation is back in vogue within the MoD but actions like this highlight the fact that on crucial questions such as engagement with Russia, Iran's nuclear programme and other key foreign policy questions of the day - opinion in the EU is divergent, and that is not something that the Lisbon Treaty could, or did, magic away. The controversial EU-US anti-terrorism data-sharing deal, named the Swift agreement, came under further attack yesterday as an almighty row broke out in the Commons. Labour’s very own Michael Connarty accused the government of treating Parliament with "disdain and contempt" by choosing to bypass the standard eight-week period given to the European Scrutiny Committee to examine such agreements, with Treasury Minister Sarah McCarthy-Fry asked to justify the Government's decision. The Swift agreement allows the US authorities to access EU citizens’ bank transactions under the name of anti-terrorism. But whilst the Government claims the agreement will protect us from the threat of terrorist attacks we are left wondering, who is protecting us, the citizens, against attacks on our civil liberties? The Lisbon Treaty was sold with the promise that it would strengthen national parliaments' ability to scrutinse EU legislation. This is a particular concern for matters concerning justice and home affairs where the UK can decide to 'opt in' to a proposal or not. Let us not forget, the negotiated 'opt in' was used by the Government to justify its decision to abandon the promised referendum on the Treaty. But it's getting even worse. "What on earth does this have to do with Sarah McCarthy-Fry, I don't think this is right". Then calling to an assistant, he asked "Did Sarah McCarthy-Fry answer a question today?". He continued "I'm really perplexed about it because if anyone would be answering EU [questions] it should be me...I don't know if I can say much more." With the Government so quick to ignore due Parliamentry process and the Minister for Europe totally unaware of what's going on, it’s sure time to recognise that democracy has not been strengthened by the Lisbon Treaty. Until the EU comes up with something actually worth talking about, it's not surprising that Obama thinks that it's more important to travel to Asia, South Africa and to attend NATO summits. Appearing in the EU's latest self-congratulation ritual is something that the leader of the world's most powerful nation has done well to stay clear of. The European Parliament today held a hearing entitled "Unity in Diversity", one of the EU's more hypocritical slogans, on the role that religious belief should play in society after ratification of the Lisbon Treaty. "Unity in diversity" is one of those wishy washy terms that often become rather meaningless. But wouldn't the EU be a much better place if this maxim, rather than that of "ever close union", was the one that prevailed, be it the EU's respect for religious differences to respect for the existing member states' differing legal systems, cultures and social and employment practices? Guess that's not what the EU really meant though is it.. So it has happened that the European Commission - aided by new powers in the Lisbon Treaty (article 121) - has effectively taken control over the Greek economy, demanding pay freezes, tax hikes and reforms of labour markets and the country's healthcare sector in a bid to get Greece's disastrous public finances in order, and avoid various nasty knock-on effects on the rest of the eurozone. Ambrose Evans-Pritchard noted today in the Telegraph the move marks a "a step-change in the level of EU intrusion." In fact, it marks an extraordinary step-change and brings both the eurozone and the EU into new, unchartered waters. It was always the risk, of course, that keeping the eurozone together would require continuous moves towards a common economic and political union, as the huge structural differences between eurozone economies require central oversight and corrective mechanisms. And the Commission wasted no time in putting the Lisbon Treaty to good use, by invoking the provisions on 'economic policy' - turning Greece into what the country's sceptical left labels an 'economic protectorate'. So European voters and taxpayers are suddenly faced with two new realities in the European project: they may have to pay for the mistakes of a government in a foreign country; and they may be forced to put up with the EU dictating their country's economic policies when the going gets tough. We're sure that very few of them feel that's what their governments once signed up to. German taxpayers and the Greek public aside, perhaps the most revealing comment on the political difficulties involved in the EU pursuing its new tools comes from Denmark, which is currently contemplating whether to join the eurozone. The FOA, a Danish trade union which represents most of the country’s public sector workers, on Monday blasted the Commission’s demands on Greece, warning that such intrusions could force the union to recommend a No vote in a future Danish referendum on euro membership (the union has previously stayed neutral on the issue). “That the EU intervenes in setting [national] wages is completely unacceptable”, Dennis Kristensen, head of the FOA, said. Getting the Greek public on board is hard enough, but getting European voters in general to accept this quantum leap of EU integration is going to be very difficult indeed. "Because of the changes involving the establishment of a EU council president and a European commission president on top of the rotating EU presidency, I think it's taking some time to work through exactly how various high-level meetings will happen." was the message, according to the WSJ, that the US State Department chose to leave on the EU's voicemail this weekend, presumably while the Spanish, who hold the EU Presidency, Herman Van Rompuy and Jose Manuel Barroso all wrestled with each other as they failed to answer the phone. Although this isn't strictly true, it's an image that fits with the 'Kissinger question' of "who do I call if I want to speak to Europe? ", if he ever actually said it that is. What is true is that President Obama has pulled out of the annual EU-US summit this spring and one of the reasons is that the EU's various presidents have been so busy arguing over who would get to shake his hand first that they apparently forgot to send out the invitations. In the words of a State Department official, "We don't even know if they're going to have one [a summit]. We've told them, 'Figure it out and let us know.'" A more diplomatic official said, "Who attends from the US and at what point will depend on who's calling the meeting. There's a competition in Europe because you now have the standing EU architecture." This was supposed to be the first high-level EU-US summit after the entry into force of the EU's 'magical cure', also known as the Lisbon Treaty, which was billed as the answer to the EU's inability to deal with the outside world as one, creating a President, a Foreign Minster, and a diplomatic service. But it turns out Obama doesn't seem that bothered about coming round to watch the EU play with its new toys. For some strange reason the US President thinks it's more important to travel to Asia in the spring, to South Africa in the summer and to Portugal for the NATO summit in the Autumn. Just a thought but maybe that's because there will be people there with something more important to say..